Hello again! I've been away from blogging for a little while due to a lovely stomach virus that decided to pay our house a visit. We are all on the mends now, and I finally got around to finishing up Audrey's closet just this morning. We have certainly come a long way since that! 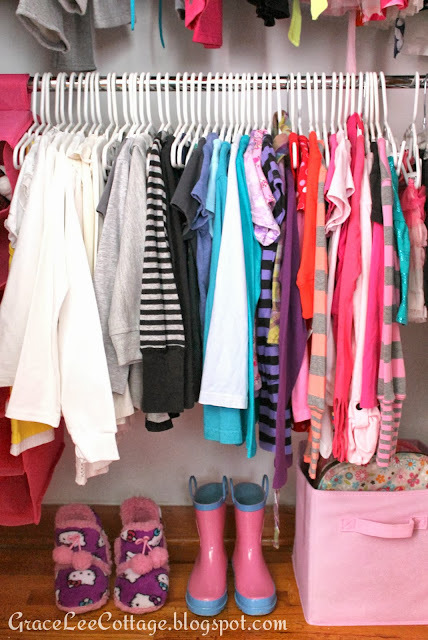 Now for all the details of this newly organized space! The first step in this overwhelming organization project was to think of a plan. My plan was pretty simple. I wanted to eliminate the second shelf, move the bar up, and put in a second bar to create double the hanging space. So we did just that! The first thing I did was clear out everything that was not a clothing related item (which was several things as you can see). All of that stuff had to be moved to another location to be stored. Most of it ended up in our basement play space. Our new rule for this closet is that it will hold clothing and shoes only! Next, I went through all of her clothing and donated anything that no longer fit her, and tossed out most of the plastic hangers that came from retail stores. My husband removed the second shelf and moved the bar up while I sorted through all the clothing. After this was done it was time to fill it back up! I already had one of those bars that you simply hang up. So that was easy! The bottom bar holds her tops and a few skirts. I organized them by color. I tried to keep the hangers cohesive as best as I could. 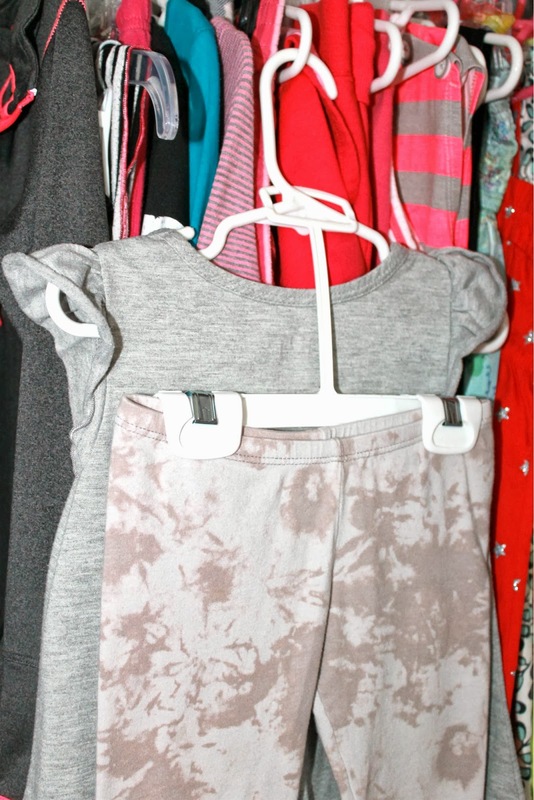 We already had a pack of the pink hangers so I chose to use those to hang her dresses. The little splash of green you see on the shelf is just a piece of washi tape. It spruces up the shelf a bit without having to do any major painting. The top shelf holds 3 bins. 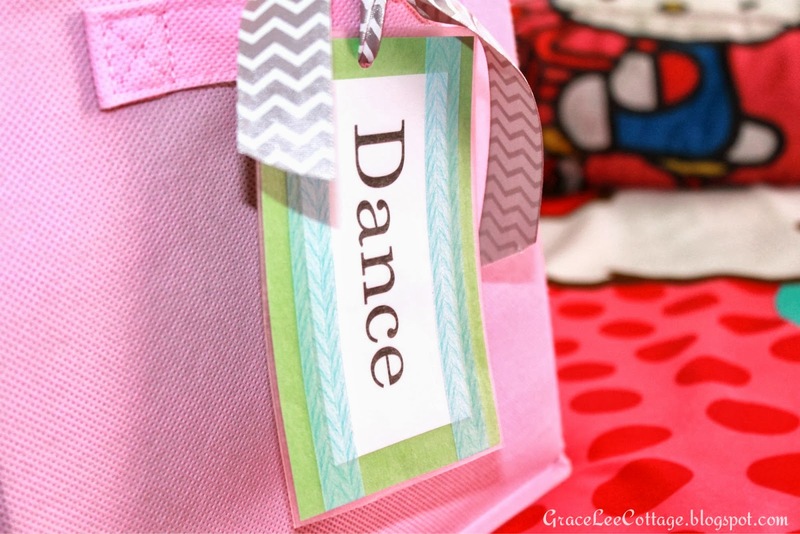 One for keepsakes, one for her dance wear, and one for extra bags and totes. I made the labels using this method and things I already had on hand like ribbon and washi tape. The bin on the floor holds her travel bags. 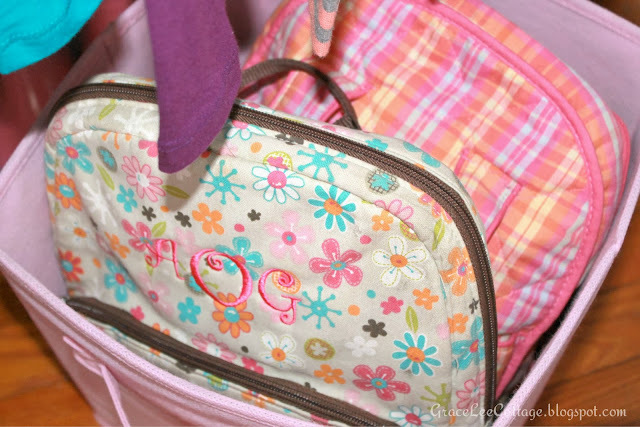 We keep a little back pack filled with coloring supplies and games so when we travel we can just grab it and go. 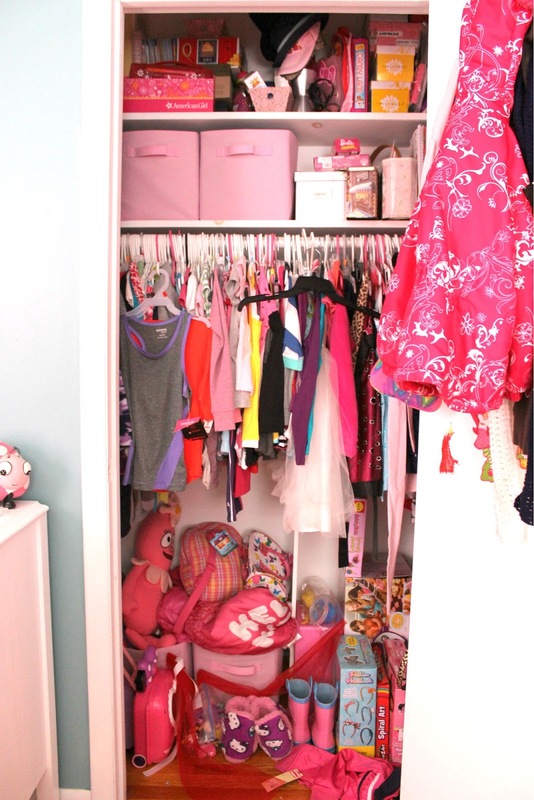 So that sums up Audrey's closet makeover! I'm hoping it will stay this organized, but who am I kidding!? I'm sure it won't stay exactly this nice and neat, but hopefully with our new systems in place, it will make things a little easier. What an outstanding before and after! 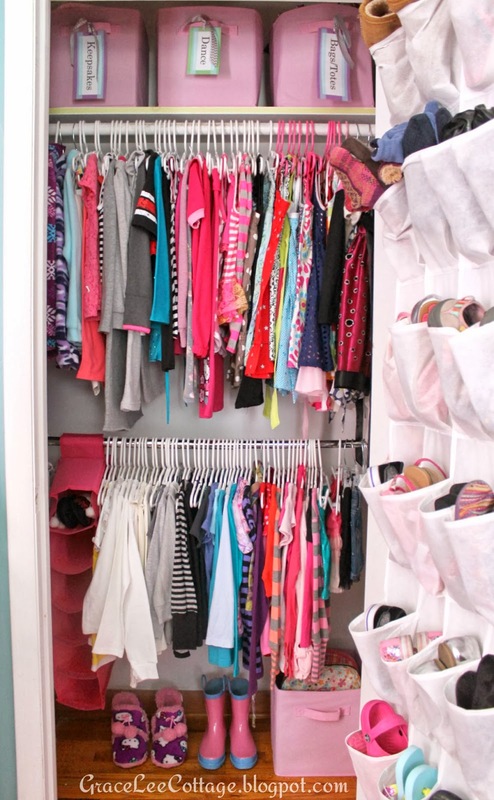 I wish you could come and help me with my girls closet!! 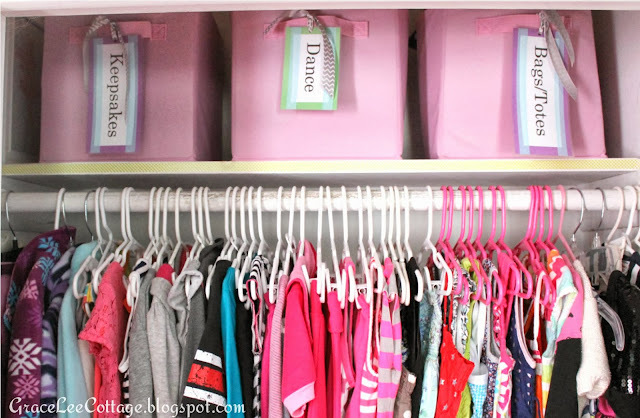 I love the idea of labeling the bins like that! Here is hoping that you are all virus free for the rest of the fall!!! Lovely job!! Thank you Nicole! Wouldn't that be awesome if we lived closer and could do projects together! Have a great day! Love the after! I love the idea of keeping the "sets" together, I am always looking for the leggings that came with the top or vise versa. Also keeping the shoes on the door is genius! Thanks for linking up, hope to see more from you. Great job! Doesn't it feel great when you know it looks that good behind a closed door? You are so ambitious! Absolutely!!! Thanks for visiting and commenting! Hi Leah! 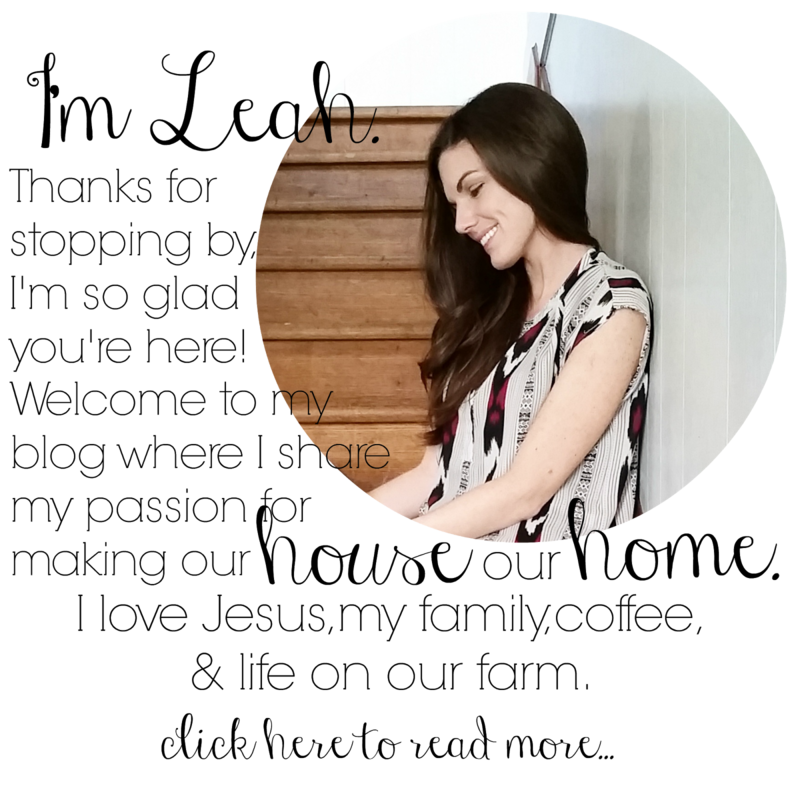 Congrats on being featured over at IHeart Organizing. I love everything you do and this closet is no exception. Great job! 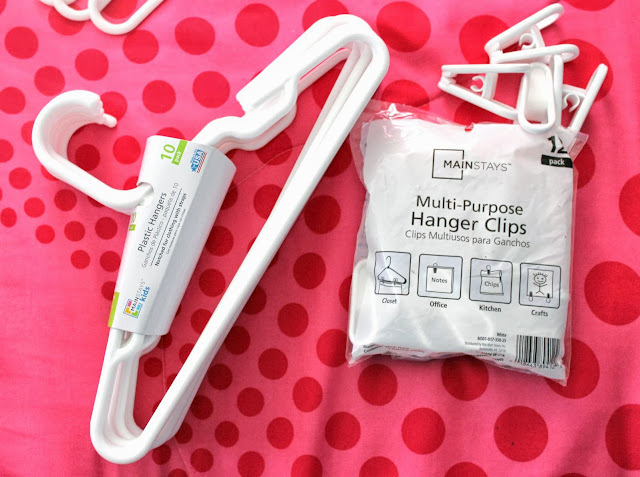 I never knew those hanger clips existed. I'm always trying to save the hangers pants come on from the store. Now I can get everything to match! I must get on my next trip to Walmart.